This is an edge of seats, powerful hour of dance that takes us into the inner circle of Caitlin and Dylan’s turbulent lives. The choreography integrates the glorious performance artistry of Ladd and Emberton with their physical setting, simply using a circle of foldable chairs, plastic cups and sweets. It is terse, intricate and, at times, frightening with the interaction between Ladd and Emberton capturing the relationship in a way that so many drama biopics fail. Conceived by Eddie Ladd, directed by Deborah Light and devised and performed by Ladd and Gwyn Emberton, the dance is just like the Thomas’s relationship, a multi-textured roller-coaster of humour and pathos, sexuality and innocence, violence and interdependency. It is also a refreshing antidote to the TV’s overkill anniversary obsession with Under Milkwood that would have left even Thomas bored with his play for voices. We start off sitting in a circle of foldable chairs at the Alcoholics Anonymous meeting in the 1970s when Caitlin faced her drinking demons. Emberton is the facilitator and Ladd is Caitlin. Some chairs are kept empty by having plastic cups on them some with sweets in them. The sweets become the alcohol that dominates their lives. 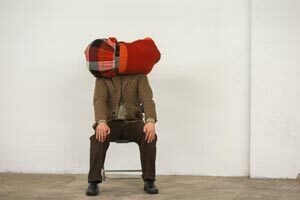 The characters use the chairs as props which they move around, fling around, squeeze through, wear, are crushed by and which are intricately employed both symbolically as well as as actual items, from a crib and high-chair to a straightjacket. While clever, the use of the chairs risks dominating our attention to the detriment of concentrating on the interaction of the actual bodies of the two dancers, as they take their dysfunctional journey through to Thomas’ death and beyond. With music by Sion Orgon and a great costume for Caitlin by Neil Davies, Ladd is the narrator with a minimum of spoken word that stresses her frustration at having once been an equal partner with aspirations of being a great dancer to the mum and left at home wife of a great poet as her husband’s fame, affairs and drinking advance. The words spoken by Ladd are not that of a faultless victim. Rather, the most effective part of the work is the choreography that conveys the pair as two equally drunken, playful, sexual, out of control interdependent individuals with dance that is at times quirky and charming yet ultimately deeply disquieting.